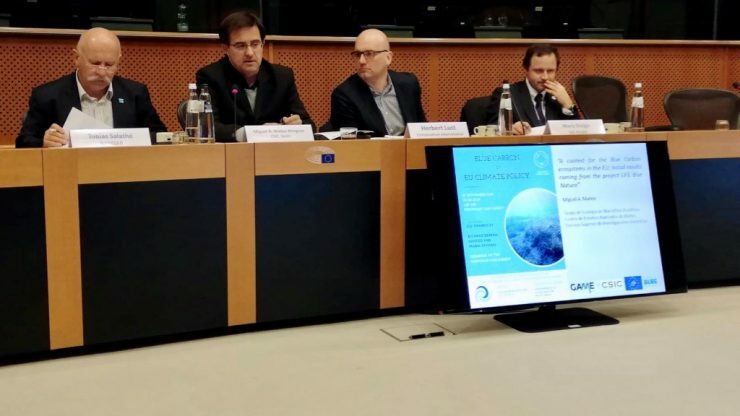 Last Tuesday Miguel Ángel Mateo Mínguez (Group of Aquatic Macrophyte Ecology, Centre for Advanced Studies of Blanes – CSIC), was invited by the International Union for the Conservation of Nature (IUCN), to the debate “Blue Carbon in EU Climate Policy”, as one of the main experts in Blue Carbon of the European Union. 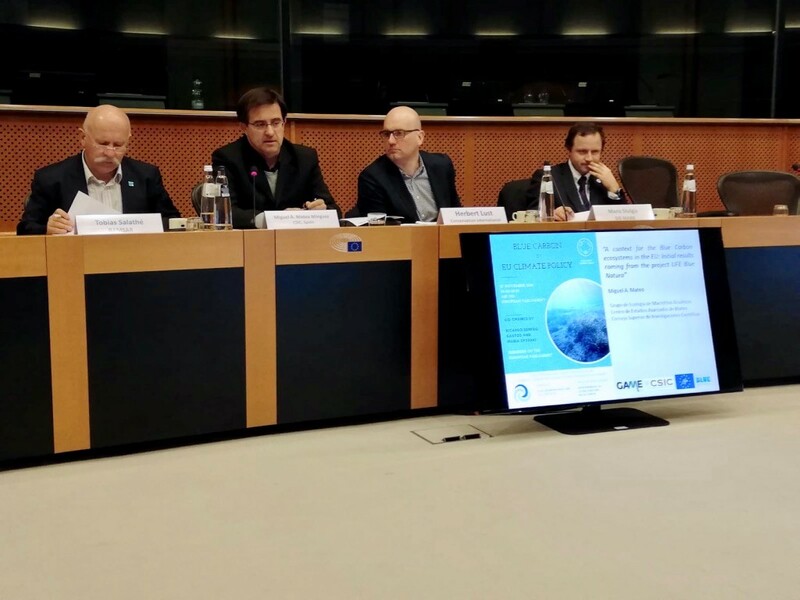 The debate was hosted at the European Parliament (Brussels) by the Members of the European Parliament (MEPs) Ricardo SERRÃO SANTOS and Maria SPYRAKI, and organized by the European Parliament Intergroup on “Climate Change, Biodiversity & Sustainable Development”. 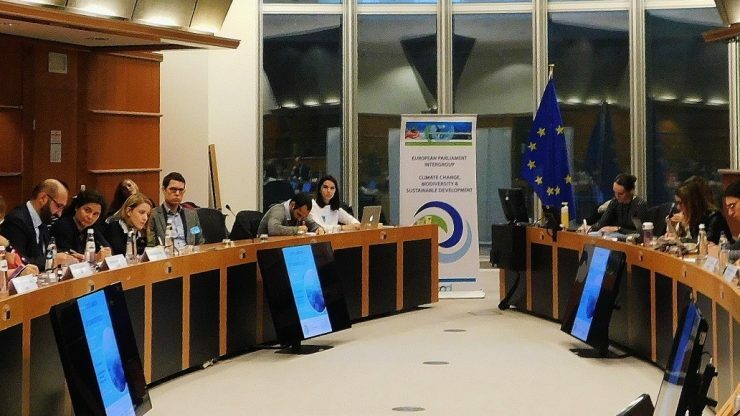 Miguel A. Mateo was committed to present for the first time in the EU Parliament a context on the possible role of European seagrass meadows and saltmarshes in the global carbon cycle and their potential to be included in the CO2 emission offset inventories of the EU. “Seagrass meadows and saltmarshes occupy about 30,000 and 5,000 km2 in the EU, respectively. Jointly they store CO2 stocks equivalent to the annual emissions of China and as much as 30 years of CO2 emissions of Spain”, explained Mateo. Terrestrial forests are the only ecosystems accepted by the international conventions as susceptible to carbon offset projects (“compensate your excess of emissions by planting trees”). GAME is a pioneer group in the investigation of the phenomenon of long-term carbon accumulation in coastal ecosystems of the world, and in defending the inclusion of these ‘marine coastal forests’ in the national emissions offset systems. “The stocks under EU coastal vegetated ecosystems equal 57% of that stored in all the terrestrial forests of the EU; besides, Blue Carbon ecosystems soils are 5 times more efficient in the sequestration of CO2 than terrestrial forests; is therefore 5 times more cost-effective to invest in the restoration or conservation of seagrass meadows and saltmarshes than in terrestrial forests”, says Mateo. The panel was integrated also by the NGO Conservation International, by RAMSAR (Convention of Wetlands), and by DG Mare (EU Department responsible of Maritime Affairs and Fisheries). The table agreed that it is urgent to act politically to protect and restore these ecosystems for their contribution to the mitigation of the CO2 emissions and on the need of more research to improve the current estimates of stocks and fluxes. After all, quality research is essential as a foundation for efficient and successful management policies. 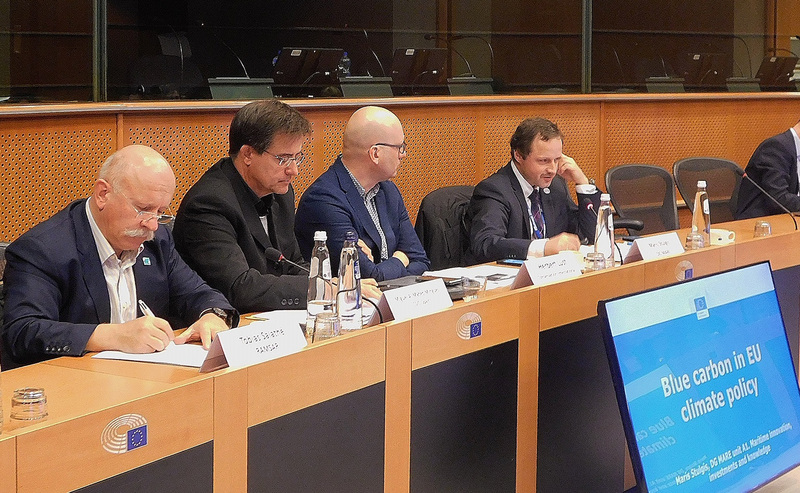 The reaction of the MEPs hosting the event was very positive as reflected in their comments during the debate and via tweeter: “While we need to focus efforts on achieving the objectives of the Paris Agreement, the role of Blue Carbon is key to reducing emissions and supporting Climate Actions. At the European level, the Mediterranean region offers plenty of good practices that must therefore be supported”, said Maria Spyraki, with a clear reference to the project LIFE Blue Natura. 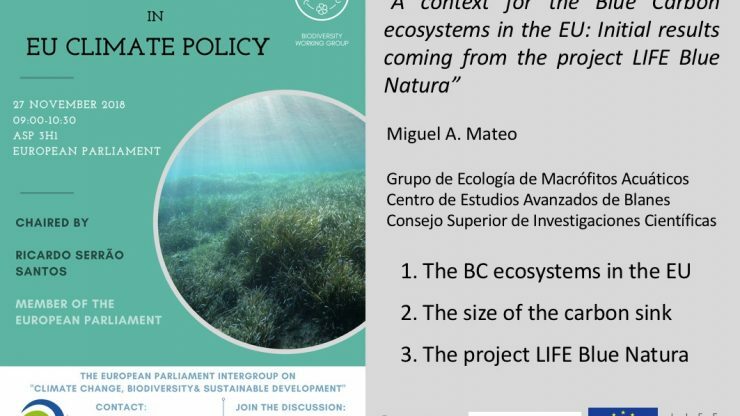 Miguel A. Mateo concluded his contextualization of the BC in the EU by saying that, “Although rough, the estimates presented here strongly suggest that, even if only based on the carbon sequestration service, the conservation and restoration of EU seagrass meadows and saltmarshes could be economically self-sustainable”. The next steps will by to maintain the momentum acquired in this first contact with high level policy makers to have the BC ecosystems considered equally relevant as terrestrial forests in the policies of mitigation of the Climate Change by bringing the message to even higher levels. The Junta de Andalusia has taken a pioneer step in the world’s context by including the BC ecosystems in the inventory of the emissions offset system of the region (SACE). 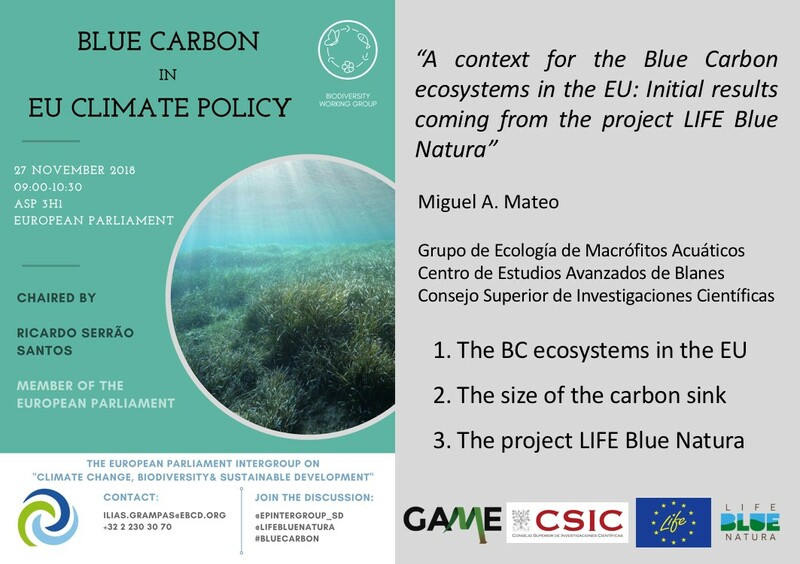 The project LIFE Blue Natura, with CSIC (GAME-CEAB) as one of the main partners, has been working in providing the accurate science needed to achieve this goal. It is planned to upscale the approach of LIFE Blue Natura to the national and EU levels in the short-medium term.